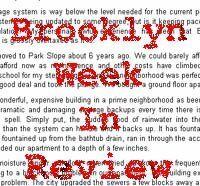 We're road testing a new weekly feature--an end of the week Brooklyn wrap-up called "Brooklyn Week in Review," which will highlight some of the particularly important, interesting or amusing stories of the week. The BrooklynSpeaks group, which some Atlantic Yards opponents immediately started referring to as BS, made its debut online. Its supporters offered an explanation of why they did it, but it was not welcomed with enthusiasm by longtime Atlantic Yards activists, some of whom suggest the group was actually a closet supporter of the arena. Some argued that they were ignoring all of the blogs and groups that have been covering the Atlantic Yards story, some for years. The City Planning Commission, meanwhile, called for reducing Atlantic Yards...to the size it was in the original proposal, before nearly a million square feet were added by the developer. And Forest City Ratner agreed. With the public comment period on the Draft Environmental Impact Statement closing today (9/29), the Council of Brooklyn Neighborhoods, which was funded by the City Council to review the DEIS, planned to submit a report at 1:00 citing the "profound...errors and shortcomings" and saying the DEIS should not be approved. The Empire State Development Corporation, meanwhile, continued to stonewall Freedom of Information Law requests for Atlantic Yard fiscal impact and other information. The Greenpoint Oil Spill is still raising concerns about the neighborhood's case of explosive gas and why the poisoning of residents has dragged on for decades without a cleanup, but most residents don't want to let officials near the homes for testing. Is this mess why a church is conducting Sunday services and Praising the Lord in the back of Cafe Grumpy on Meserole Avenue? In South Williamsburg, they don't need espresso with their worship, because a synogogue went up in two weeks, stop-work order notwithstanding. Regardless, keep your head down during the Park Slope-Cobble Hill Coffee War. Want to convert your Prospect Heights property to luxury housing? Well, brick in the last remaining tenant. Or, you can just surround a building with a construction site, like on Eighth Avenue in the South Slope, and drive out the tenants by cracking the building in half. On the other hand, being bricked in or having your building collapse around you is nothing compared to how nasty it can be to live in "supportive housing" in Brooklyn or in the "dorm from hell" at Long Island University in Brooklyn. For Richard Meier's new glass building at Grand Army Plaza, on the other hand, expect to pay $790K to $6 million, but you probably won't have to worry about horror movie-sized bedbugs. Oh, and we found out that some Park Slope restaurants, like Sette, won't help out a mommy who needs to warm her baby bottle, which can't be a good reputation to develop in the Slope. Wonder how they feel about breast feeding? And, finally, you really know summer's over when they turn the lights out on the Parachute Jump so that migratory birds don't fly into it and cease to migrate. Fly south, little friends. Fly south. The dorm from hell is at LIU, not Brooklyn College. Not that BC doesn't have facilities problems, but they don't have dorms, that I know of.